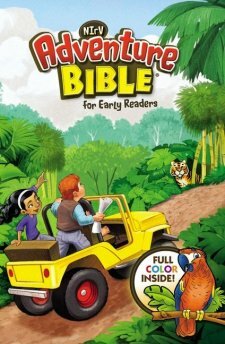 The Adventure Bible for Early Readers is a fantastic Bible for young children who have moved past a story book style Bible. It is an excellent next step for those who have children ages 6 to 10. The Bible is written in the NIrV translation. NIrV is the New International Reader’s Version published by Zonderkidz a division of Zondervan. The term Early Reader’s is not meant to convey those children who are just reading sight words. My son is 6 and it is clearly appropriate for him. While he may not be able to read every Old Testament name, he will be able to learn to navigate this Bible and read a majority of it. I love this Bible for many reasons. The cover is eye-catching and appealing to a young reader. It has a 3-D image and communicates the idea of adventure! On the inside, there are also lots of colorful pages and illustrations. Within each book of the Bible there are boxes with information and interesting facts that I know my son will love to explore. These feature boxes include Life in Bible Times, People in Bible Times, Words to Treasure, Live it, and my favorite, Did You Know? This is definitely a five-star offering from Zonderkidz! I was given a complimentary copy of this Bible from its publisher and BookLookBloggers in exchange for an honest review. I have not been compensated and all opinions are my own.